The blog of Andy Ihnatko, intermittently-beloved technology journalist. Okay! It’s done. Ordering went live for me at about 3:30 AM. The 32 gig model was available for Friday delivery. The one I wanted is either in short supply or high demand…I won’t get it until next week. I hesitated when I saw the delivery date. In-store pickup wasn’t available when I ordered, but it’s certainly possible that they’ll be in stores before it’s on my doorstep. My Apple review unit arrives for sure on Friday, so my editorial needs are certainly covered either way. In the end, I decided that I wanted to make the (educated) leap of faith and buy one of my own. So why not have it hand-delivered? Plus, if I’m gonna wait, I might as well have it engraved to make it easy for honest people to find me if it gets lost or stolen. No, of course that screenshot doesn’t show the actual engraving (my name and contact info). But if Apple allowed a whole paragraph, I don’t think you could do better than to lie and claim that this $1000 device is in fact a Golden Ticket to a personal meeting with a fabulous and unambiguously-beloved Hollywood celebrity. Update: Wow, I don’t know what happened. Maybe I ordered it too soon after everything went live? In-store pickup options weren’t available when I started the ordering process. After I posted on Twitter about my order and folks told me they’d been able to get theirs today, I went back and re-checked. Voilá! So I canceled the first order. I expect to have this thing in my hands in just five or six hours. Yay! It looks as if the Pencil won’t be ready for anybody for another week. Not available for in-store pickup, and even in my rattlesnake-fast online order, it was going to ship a week after my iPad. I’ll have a Pencil on Friday (along with the keyboard case and other accessories) with my Apple review unit. I even extended my search and the Pencil can’t be had in-store anywhere in New England! Wowzers. This time around the Apple Store app was slow to update. I followed the direct link to purchase from the MacRumors forum pre-order thread. The Apple Pencil went live around 3:07 AM, available for pickup as Soho (NYC) and then shortly after the iPad Pro went live, again direct links from the pre-order thread, got that for pick-up as well. NYC has so many stores, yet at the time it went live only Soho was available. I saw that after a few minutes the other stores were available as an option too. I forgot to add that I ended up getting the 128GB Space Gray WiFi (Thanks to @dmoren), which should be available for pickup today. And you didn’t get the AppleCare+ ? Seems it would be worth considering the price of the tablet. Don’t think everyone needs to always buy Apple Care +. I doubt Andy is going to ever clumsily fumble with a 12″ device while getting it out of his bag and have it land on cement. Plus I would imagine a lot of the time he will be keeping it at home. I was about to go back to sleep when I saw a post on Mac Rumors where they were able to order directly on the web site. 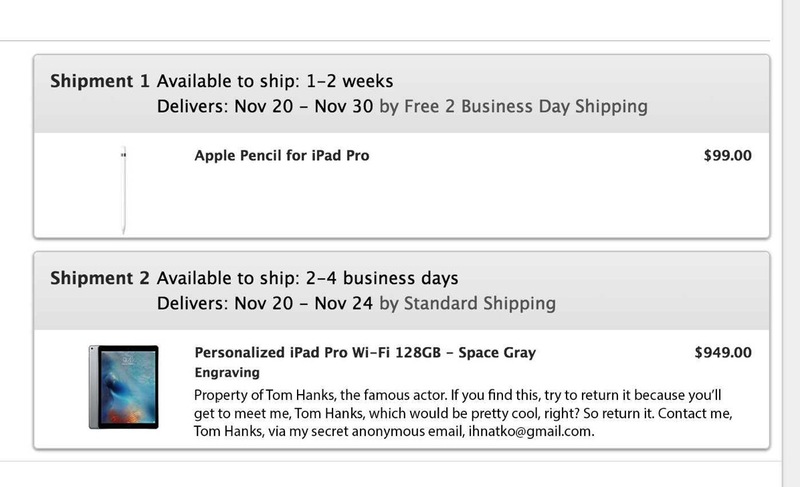 I was able to order the iPad i wanted but the pencil was already unavailable for pickup. The keyboard was available but I opted for just the smart cover. I plan to go pick up my new iPad Pro when I get email confirmation later this morning. Happily awaiting my iPadPro, but was disappointed that I was going to have to wait a little while longer for the pencil. #firstworldproblem I guess. Andy, you’re the best! Thanks for the update Andy! I had much the same experience as yourself. After placing my order for the 128Gb LTE Space Gray model a little after midnight PST, I retired for the evening with that satisfied feeling one gets after doing such. I had won! Upon awaking, of course I checked on expected ship dates, as I think we all use that as a judge of what kind of volume Apple is selling. WHAT! AVAILABLE FOR PICKUP? Where are my keys? Correction, pants, then keys, and I was off to the fabulous Las Vegas Strip. I summized my odds were better at the Forum Shops within Ceasars Palace. Hardly convenient for locals, but I was counting on the tourists sleeping off the previous nights festivities. Three poeple ahead of me in line. Didn’t look like iPad Pro folks in my “professional please don’t buy the thing I want” mind. Success, I made the kill, and cancelled my online order. Next up, keyboard. Don’t like Apple’s attempt, as a backlite is a must for me, and the fabric cover…not so much. Like I have heard you say many times, Apple just doesn’t do input devices all that well, perhaps except for the track pad. I REALLY like the Logitech Create Keyboard!! Of course I wanted the blue one. Sorry, only black here. Blue was at the Fashion Show Mall just three Casino Resort Mega Hotels down the road. More dodging the tourists as they fought the sun clutching their last “free” drink…….and I arrived. Once in the store, I asked for assistance. I was informed by a pleasant gentlemen before I could speak, SORRY..we are sold out of all Ipad Pro models for a few weeks. I chuckled and said, “Oh, that old thing?” No sir, I’m just here for the Logitech Create in Blue for the Pro Model. One last thumb print Apple Pay purchase, and I was headed home. I’m anxious to hear your thoughts on this keyboard. very confident you will like it! As always Andy, THANK YOU for all you do! So enjoy your columns, writing, and of course you’re the real star of MacBreak Weekly! No offense Leo! I like him too……. Ah! So that’s how people got ’em. I didn’t bother looking for the Pencil separately before the iPad itself went hot. I suspect that most others did the same thing. I, too, didn’t see live ordering for the iPad Pro until about 3:15 AM Eastern.